(Born Giovanni Francesco di Bernardone; 1181/1182– October 3, 1226)was an Italian Catholic friar and preacher. He founded the men's Franciscan Order, the women’s Order of St. Clare, and the lay Third Order of Saint Francis. St. Francis is one of the most venerated religious figures in history. Francis was the son of a wealthy cloth merchant in Assisi, and he lived the high-spirited life typical of a wealthy young man, even fighting as a soldier for Assisi. While going off to war in 1204, Francis had a vision that directed him back to Assisi, where he lost his taste for his worldly life. On a pilgrimage to Rome, Francis begged with the beggars at St. Peter's. The experience moved him to live in poverty. Francis returned home, began preaching on the streets, and soon amassed a following. His order was endorsed by Pope Innocent III in 1210. He then founded the Order of Poor Clares, which was an enclosed order for women, as well as the Third Order of Brothers and Sisters of Penance. In 1219, he went to Egypt in an attempt to convert the Sultan. By this point, the Franciscan Order had grown to such an extent that its primitive organizational structure was no longer sufficient. He returned to Italy to organize the order. Once his organization was endorsed by the Pope, he withdrew increasingly from external affairs. In 1223, Francis arranged for the first Christmas manger scene. In 1224, he received the stigmata, making him the first person to bear the wounds of Christ's Passion. He died in 1226 while preaching Psalm 141. Francis of Assisi was one of seven children born to Pietro di Bernardone, a rich cloth merchant, and his wife Pica, about whom little is known except that she was originally from France. Pietro was in France on business when Francis was born, and Pica had him baptized as Giovanni di Bernardone in honor of Saint John the Baptist, in the hope he would grow to be a religious leader. When his father returned to Assisi, he took to calling him Francesco ("the Frenchman"), possibly in honor of his commercial success and enthusiasm for all things French. According to another account, it was due to the boy being able to speak and sing in French fluently and effortlessly because of his French mother teaching him. Either way, the name Francesco soon replaced his baptismal name. As a youth, Francesco -or Francis in English- became a devotee of troubadours and was fascinated with all things French. Although many hagiographers remark about his bright clothing, rich friends, and love of pleasures, his displays of disillusionment toward the world that surrounded him came fairly early in his life, as is shown in the "story of the begger." In this account, he was selling cloth and velvet in the marketplace on behalf of his father when a beggar came to him and asked for alms. At the conclusion of his business deal, Francis abandoned his wares and ran after the beggar. When he found him, Francis gave the man everything he had in his pockets. His friends quickly chided and mocked him for his act of charity. When he got home, his father scolded him in rage. In 1201, he joined a military expedition against Perugia and was taken as a prisoner at Collestrada, spending a year as a captive. It is possible that his spiritual conversion was a gradual process rooted in this experience. Upon his return to Assisi in 1203, Francis returned to his carefree life and in 1204, a serious illness led to a spiritual crisis. In 1205, Francis left for Puglia to enlist in the army of the Count of Brienne. A strange vision made him return to Assisi, deepening his ecclesiastical awakening. According to the hagiographic legend, thereafter he began to avoid the sports and the feasts of his former companions; in response, they asked him laughingly whether he was thinking of marrying, to which he answered "yes, a fairer bride than any of you have ever seen," meaning his "lady poverty." He spent much time in lonely places, asking God for enlightenment. By degrees he took to nursing lepers, the most repulsive victims in the lazar houses near Assisi. After a pilgrimage to Rome, where he begged at the church doors for the poor, he said he had a mystical vision of Jesus Christ in the Church of San Damiano just outside of Assisi, in which the Icon of Christ Crucified said to him, "Francis, Francis, go and repair My house which, as you can see, is falling into ruins." He took this to mean the ruined church in which he was presently praying, and so he sold some cloth from his father's store to assist the priest there for this purpose. His father Pietro, highly indignant, attempted to change his mind, first with threats and then with beatings. After legal proceedings before the bishop, Francis renounced his father and his patrimony, laying aside even the garments he had received from him. For the next couple of months he lived as a beggar in the region of Assisi. Returning to the countryside around the town for two years this time, he restored several ruined churches, among them the Porziuncola, a little chapel of St. Mary of the Angels just outside the town, which later became his favorite abode. Clad in a rough garment, barefoot, and, after the Gospel precept, without staff or scrip, he began to preach repentance. He was soon joined by his first follower, a prominent fellow townsman, the jurist Bernardo di Quintavalle, who contributed all that he had to the work. Within a year Francis had eleven followers. Francis chose never to be ordained a priest and the community lived as "lesser brothers," fratres minores in Latin. The brothers lived a simple life in the deserted lazar house of Rivo Torto near Assisi; but they spent much of their time wandering through the mountainous districts of Umbria, always cheerful and full of songs, yet making a deep impression upon their hearers by their earnest exhortations. Francis' preaching to ordinary people was unusual since he had no license to do so. In 1209 he composed a simple rule for his followers ("friars"), (the Regula primitiva or “Primitive Rule”) which came from verses in the bible. The rule was “To follow the teachings of our Lord Jesus Christ and to walk in his footsteps.” In 1209, Francis led his first eleven followers to Rome to seek permission from Pope Innocent III to found a new religious order. Upon entry to Rome, the brothers encountered Bishop Guido of Assisi, who had in his company Giovanni di San Paolo, the Cardinal Bishop of Sabina. The Cardinal, who was the confessor of Pope Innocent III, was immediately sympathetic to Francis and agreed to represent Francis to the pope. Reluctantly, Pope Innocent agreed to meet with Francis and the brothers the next day. After several days, the pope agreed to admit the group informally, adding that when God increased the group in grace and number, they could return for an official admittance. The group was tonsured. This was important in part because it recognized Church authority and prevented his following from possible accusations of heresy, as had happened to the Waldensians decades earlier. Though Pope Innocent initially had doubts, following a dream in which he saw Francis holding up the Basilica of St. John Lateran (the bishopric seat of the Pope and cathedral of Rome, thus the 'home church' of all Christendom), he decided to endorse Francis' order. This occurred, according to tradition, on April 16, 1210 and constituted the official founding of the Franciscan order. The group, then the "Lesser Brothers" (Friars Minor or Franciscan Order), preached on the streets and had no possessions. They were centered in Porziuncola, and preached first in Umbria, before expanding throughout Italy. On Palm Sunday, March 28, 1211, Francis received Clare at the Porziuncola and hereby established the Order of Poor Ladies, later called Poor Clares. This was an order for women, and he gave a religious habit, or dress, similar to his own to the noblewoman later known as St. Clare of Assisi, before he then lodged her and a few companions in the church of San Damiano. There they were joined by many other women of Assisi. For those who could not leave their homes, he later formed the Third Order of Brothers and Sisters of Penance. This was a lay fraternity whose members neither withdrew from the world nor took religious vows. Instead, they carried out the principles of Franciscan life. Before long this order grew beyond Italy. Determined to bring the Gospel to all God’s creatures, Francis sought on several occasions to take his message out of Italy. In the late spring of 1212, he set out for Jerusalem, but he was shipwrecked by a storm on the Dalmatian coast, forcing him to return to Italy. On May 8, 1213, he was given the use of the mountain of La Verna (Alverna) as a gift from the count Orlando di Chiusi who described it as “eminently suitable for whoever wishes to do penance in a place remote from mankind.” The mountain would become one of his favorite retreats for prayer. In the same year, Francis sailed for Morocco, but this time an illness forced him to break off his journey in Spain. Back in Assisi, several noblemen (among them Tommaso da Celano, who would later write the biography of St. Francis) and some well-educated men joined his order. In 1215, Francis went again to Rome for the Fourth Lateran Council. During this time, he probably met Dominic de Guzman (later to be Saint Dominic, the founder of the Friars Preachers, another Catholic religious order). In 1217 he offered to go to France. Cardinal Ugolino of Segni (the future Pope Gregory IX), an early and important supporter of Francis, advised him against this and said that he was still needed in Italy. In 1219, accompanied by another friar and hoping to convert the Sultan of Egypt or win martyrdom in the attempt, Francis went to Egypt where a Crusader army had been encamped for over a year besieging the walled city of Damietta two miles (3.2 kilometers) upstream from the mouth of one of the main channels of the Nile. The Sultan, al-Kamil, a nephew of Saladin, had succeeded his father as Sultan of Egypt in 1218 and was encamped upstream of Damietta, unable to relieve it. A bloody and futile attack on the city was launched by the Christians on 29 August 1219, following which both sides agreed to a ceasefire which lasted four weeks. It was most probably during this interlude that Francis and his companion crossed the Saracen lines and were brought before the Sultan, remaining in his camp for a few days. The visit is reported in contemporary Crusader sources and in the earliest biographies of Francis, but they give no information about what transpired during the encounter beyond noting that the Sultan received Francis graciously and that Francis preached to the Saracens without effect, returning unharmed to the Crusader camp. No contemporary Arab source mentions the visit. One detail, added by Bonaventure in the official life of Francis (written forty years after the event), concerns an alleged challenge by Francis offering trial-by-fire in order to prove the veracity of the Christian gospel. Although Bonaventure does not suggest as much, subsequent biographies went further, claiming that a fire was kindled which Francis unhesitatingly entered without suffering burns. Such an incident is depicted in the late 13th c. fresco cycle, attributed to Giotto, in the upper basilica at Assisi. According to some late sources, the Sultan gave Francis permission to visit the sacred places in the Holy Land and even to preach there. All that can safely be asserted is that Francis and his companion left the Crusader camp for Acre, from where they embarked for Italy in the latter half of 1220. Drawing on a 1267 sermon by Bonaventure, later sources report that the Sultan secretly converted or accepted a death-bed baptism as a result of the encounter with Francis. The Franciscan Order has been present in the Holy Land almost uninterruptedly since 1217 when brother Elias arrived at Acre. It received concessions from the Mameluke Sultan in 1333 with regard to certain Holy Places in Jerusalem and Bethlehem, and (so far as concerns the Catholic Church) jurisdictional privileges from Pope Clement VI in 1342. At Greccio near Assisi, around 1220, Francis celebrated Christmas by setting up the first known three-dimensional presepio or crèche (Nativity scene). His nativity imagery reflected the scene in traditional paintings. He used real animals to create a living scene so that the worshipers could contemplate the birth of the child Jesus in a direct way, making use of the senses, especially sight. Thomas of Celano, a biographer of Francis and Saint Bonaventure both, tell how he only used a straw-filled manger (feeding trough) set between a real ox and donkey. According to Thomas, it was beautiful in its simplicity with the manger acting as the altar for the Christmas Mass. By this time, the growing congregation of friars was divided into provinces and groups were sent to France, Germany, Hungary, Spain and to the East. When receiving a report of the martyrdom of five brothers in Morocco, Francis returned to Italy via Venice. Cardinal Ugolino di Conti was then nominated by the Pope as the protector of the Order. The friars in Italy at this time were causing problems, and as such, Francis had to return in order to correct these problems. The Franciscan Order had grown at an unprecedented rate, when compared to prior religious orders. Unfortunately, however, its organizational sophistication had not kept up with this growth and had little more to govern it than Francis' example and simple rule. To address this problem, Francis prepared a new and more detailed rule, the "First Rule" or "Rule Without a Bull" (Regula prima Regula non bullata) which again asserted devotion to poverty and the apostolic life. However, it introduced greater institutional structure although this was never officially endorsed by the pope. On September 29, 1220, Francis handed over the governance of the Order to brother Peter Catani at the Porziuncola. However, Brother Peter died only five months later, on March 10, 1221, and was buried in the Porziuncola. When numerous miracles were attributed to the late Peter Catani, people started to flock to the Porziuncola, disturbing the daily life of the Franciscans. Francis then prayed, asking Peter to stop the miracles and obey in death as he had obeyed during his life. The reports of miracles ceased. Brother Peter was succeeded by Brother Elias as Vicar of Francis. Two years later, Francis modified the "First Rule" (creating the "Second Rule" or "Rule With a Bull"), and Pope Honorius III approved it on November 29, 1223. As the official rule of the order, it called on the friars "to observe the Holy Gospel of our Lord Jesus Christ, living in obedience without anything of our own and in chastity." In addition, it set regulations for discipline, preaching, and entry into the order. Once the rule was endorsed by the Pope, Francis withdrew increasingly from external affairs. During 1221 and 1222 Francis crossed Italy, first as far south as Catania in Sicily and afterward as far north as Bologna. While he was praying on the mountain of Verna, during a forty-day fast in preparation for Michaelmas (September 29), Francis is said to have had a vision on or about September 14, 1224, the Feast of the Exaltation of the Cross, as a result of which he received the stigmata. Brother Leo, who had been with Francis at the time, left a clear and simple account of the event, the first definite account of the phenomenon of stigmata. "Suddenly he saw a vision of a seraph, a six-winged angel on a cross. This angel gave him the gift of the five wounds of Christ." Suffering from these stigmata and from an eye disease, Francis received care in several cities (Siena, Cortona, Nocera) to no avail. In the end, he was brought back to a hut next to the Porziuncola. Here, in the place where it all began, feeling the end approaching, he spent the last days of his life dictating his spiritual testament. He died on the evening of October 3, 1226, singing Psalm 141. On July 16, 1228, he was pronounced a saint by Pope Gregory IX (the former cardinal Ugolino di Conti, friend of St Francis and Cardinal Protector of the Order). The next day, the Pope laid the foundation stone for the Basilica of Saint Francis in Assisi. He was buried on May 25, 1230, under the Lower Basilica. His burial place remained inaccessible until it was reopened in 1818. Pasquale Belli then constructed for his remains a crypt in neo-classical style in the Lower Basilica. It was refashioned between 1927 and 1930 into its present form by Ugo Tarchi, stripping the wall of its marble decorations. In 1978 the remains of St. Francis were identified by a commission of scholars appointed by Pope Paul VI, and put in a glass urn in the ancient stone tomb. Saint Francis is considered the first Italian poet by literary critics. He believed commoners should be able to pray to God in their own language, and he wrote often in the dialect of Umbria instead of Latin. His writings are considered to have great literary value, as well as religious. It has been argued that no one in history was as dedicated as Francis to imitate the life, and carry out the work, of Christ in Christ’s own way. This is important in understanding Francis' character and his affinity for the Eucharist and respect for the priests who carried out the sacrament. He and his followers celebrated and even venerated poverty. Poverty was so central to his character that in his last written work, the Testament, he said that absolute personal and corporate poverty was the essential lifestyle for the members of his order. He believed that nature itself was the mirror of God. He called all creatures his “brothers” and “sisters,” and even preached to the birds and supposedly persuaded a wolf to stop attacking some locals if they agreed to feed the wolf. In his “Canticle of the Creatures” (“Praises of Creatures” or “Canticle of the Sun”), he mentioned the “Brother Sun” and “Sister Moon,” the wind and water, and “Sister Death.” He referred to his chronic illnesses as his “sisters." His deep sense of brotherhood under God embraced others, and declared that “he considered himself no friend of Christ if he did not cherish those for whom Christ died.” Francis's visit to Egypt and attempted rapprochement with the Muslim world had far-reaching consequences, long past his own death, since after the fall of the Crusader Kingdom it would be the Franciscans, of all Catholics, who would be allowed to stay on in the Holy Land and be recognized as "Custodians of the Holy Land" on behalf of Christianity. Many of the stories that surround the life of St. Francis deal with his love for animals. Perhaps the most famous incident that illustrates the Saint's humility towards nature is recounted in the "Fioretti" ("Little Flowers"), a collection of legends and folklore that sprang up after the Saint's death. It is said that, one day, while Francis was traveling with some companions, they happened upon a place in the road where birds filled the trees on either side. Francis told his companions to "wait for me while I go to preach to my sisters the birds." The birds surrounded him, intrigued by the power of his voice, and not one of them flew away. Another legend from the Fioretti tells that in the city of Gubbio, where Francis lived for some time, was a wolf "terrifying and ferocious, who devoured men as well as animals." Francis had compassion upon the townsfolk, and went up into the hills to find the wolf. Soon, fear of the animal had caused all his companions to flee, though the saint pressed on. When he found the wolf, he made the sign of the cross and commanded the wolf to come to him and hurt no one. Miraculously the wolf closed his jaws and lay down at the feet of St. Francis. "Brother Wolf, you do much harm in these parts and you have done great evil," said Francis. "All these people accuse you and curse you...But brother wolf, I would like to make peace between you and the people." Then Francis led the wolf into the town, and surrounded by startled citizens made a pact between them and the wolf. Because the wolf had “done evil out of hunger, the townsfolk were to feed the wolf regularly. In return, the wolf would no longer prey upon them or their flocks. In this manner Gubbio was freed from the menace of the predator. Francis even made a pact on behalf of the town dogs, that they would not bother the wolf again. Finally, to show the townspeople that they would not be harmed, Francis blessed the wolf. Francis preached the teaching of the Catholic Church, that the world was created good and beautiful by God but suffers a need for redemption because of the primordial sin of man. He preached to man and beast the universal ability and duty of all creatures to praise God (a common theme in the Psalms) and the duty of men to protect and enjoy nature as both the stewards of God's creation and as creatures ourselves. Legend has it that on his deathbed, St. Francis thanked his donkey for carrying and helping him throughout his life, and his donkey wept. Saint Francis's feast day is observed on October 4. A secondary feast in honor of the stigmata received by St Francis, celebrated on September 17, was inserted in the General Roman Calendar in 1585 (later than the Tridentine Calendar) and suppressed in 1604, but was restored in 1615. In the New Roman Missal of 1969, it was removed, as something of a duplication of the main feast on October 4, from the General Calendar and left to the calendars of certain localities and of the Franciscan Order. Wherever the traditional Roman Missal is used, however, the feast of the Stigmata remains in the General Calendar. On June 18, 1939, Pope Pius XII named Francis a joint Patron Saint of Italy along with Saint Catherine of Siena with the apostolic letter "Licet Commissa", AAS XXXI (1939), 256-257. Pius XII mentioned the two saints in the laudative discourse he pronounced on May 5, 1949 in the Santa Maria sopra Minerva church. St. Francis is honored in the Church of England, the Anglican Church of Canada, in the Old Catholic Churches, the Evangelical Lutheran Church in America, and other churches and religious communities on October 4. The Evangelical Church in Germany, however, commemorates St. Francis' feast day on his death day, October 3. 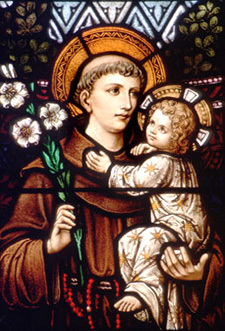 St. Anthony of Padua, Priest and Doctor (memorial) Anthony was born in Lisbon, Portugal about the year 1195 to a very wealthy family, the son of Martin Vincente de Bulhao and Teresa Pais Taveira, who wanted him to become a noble. However, Anthony had other ambitions. Against the wishes of his family, he entered the Augustinian Abbey of St. Vincent on the outskirts of Lisbon. The Canons Regular of St. Augustine, of whom he was now a member, were known for their dedication to scholarly studies. Anthony studied Scripture and the Latin classics. During this time he was constantly visited by friends and relatives, bringing expensive gifts and news from their social world which he found very disturbing. His studies suffered and he could find no peace. He persuaded his superiors to transfer him to the Augustinian Santa Cruz Monastery (Monastery of the Holy Cross) in Coimbra, then the capital of Portugal, to continue his studies there. Following his ordination to the priesthood, Anthony became responsible for hospitality at the monastery. It was then in 1219, that he came in contact with five Franciscans who were going to Morocco to preach to Muslims. Anthony found the simple lifestyle of the Franciscans highly attractive. In February of the following year, it was learned that the five Franciscans had been martyred in Morocco. Anthony was deeply struck by their heroism and felt called by God to leave everything and follow Jesus. He got permission from his superiors to transfer to the Franciscans. In the summer of 1220 he received the Franciscan habit and began to study the teachings of the Founder, Francis of Assisi. He took the name Anthony in honour of St. Anthony the Great, to whom the Franciscan hermitage where he was living was dedicated. Soon afterwards, he set off for Morocco with another friar with the intention of preaching the Gospel there. However, he became so ill on his arrival, that he had to return to Portugal. On the way back, his ship was driven by a storm to the coast of Sicily and landed at Messina. From there Anthony made his way to Assisi in northern Italy and asked to be admitted to the friary there but, because of his sickly appearance, they were reluctant to accept him. And he told them nothing about his studies, so he was sent to the rural hospice of San Paolo, near Forli in the Romagna, where a priest was needed to say Mass for the Franciscan brothers. There he lived the life of a hermit and worked in the kitchen. On one occasion when there was an ordination ceremony, many Dominican friars had been invited. It was expected that one of them - the Dominicans specialized in preaching - would give the homily but they had come unprepared, presuming that one of the Franciscans would preach. The superior felt that the only person in the community who was in any way qualified to preach was Anthony and, in spite of his objections, he was called on. To eveyone's amazement, his sermon and his insights into the Gospel made a deep impression on those present - both the quality of his voice, his learning and his eloquence. It was then that Brother Gratian, the minister provincial, sent Anthony to preach the Gospel all over Lombardy, a region of northern Italy. His skills were now widely recognized and, in addition to preaching, he taught at the universities of Montpellier and Toulouse in southern France. But it was as a preacher that he was most admired. In 1226, after attending the Franciscan chapter in Arles in France, and preaching in the French region of Provence, he returned to Italy and was sent as envoy from the Franciscan general chapter to Pope Gregory IX. At the Vatican court, his preaching was hailed as a 'jewel case of the Bible', and he was commissioned to prepare a collection of "Sermons for Feast Days". On 30 May 1226 he was chosen as minister provincial of the Emilia-Romagna region. In 1231 he became ill with dropsy and, went to the woodland retreat to Camposanpiero with two other friars to recover. He lived in a cell built for him under the branches of a walnut tree. He died on 12 June 1231 at the Poor Clare convent at Arcella on his way back to Padua at the early age of 36. When he died, it is said that children cried in the streets, all the bells of the churches rang of their own accord and angels came down to ring the bells for the death of a saint. Pictures of Anthony most often show him holding the Infant Jesus in his arms. This refers to an apparition he is said to have had of the Infant Jesus. French writers say it took place at the Castle of Chateauneuf-la-Foret in the province of Limousin while the Italians claim it was Camposanpiero near Padua. It is also said that St. Francis of Assisi appeared to him during a provincial chapter at Aries, in the south of France. Anthony is buried in a chapel (once a church, now enclosed by the present building) of the large Basilica of Saint Anthony of Padua. The house where he was born in Lisbon was turned into a church, the Igreja Santo Antonio de Lisbon. He is one of the Catholic Church's most popular saints. Anthony was declared a Doctor of the Church on 16 January 1946. He is often invoked for the recovery of things lost. In 1193, Clare was born in Assisi, Italy. As the daughter of wealthy parents, she was educated in reading and writing as well as in the domestic arts of spinning and needlework. Though raised among the nobility, she cared little for the social life which surrounded her. Greatly influenced by the piety of her mother, she decided to dedicate her life to God. Caring and praying for the poor, Clare saved food from her family table to distribute to the needy outside the doors of her home. It is believed that Clare heard St. Francis preaching in the streets of Assisi about his new religious community of men called Friars who relied solely on alms or begging for their needs. Clare was inspired by his words. Clare’s parents decided that she would marry a wealthy young man. In desperation, Clare fled her home and sought refuge with Francis, who received her into religious life. Clare lived briefly at San Paolo delle Abdesse, a nearby Benedictine monastery of nuns. Then she moved again for a short period to a house of female penitents, Sant’Angelo in Panza on Monte Subasio. She was joined there by her sister Agnes. San Damiano became the focal point for Clare’s new religious Order, the “Order of San Damiano”. By 1263, 10 years after Clare’s death, the order would be known as the Order of Saint Clare. Unlike the Franciscan friars who moved freely around the country to preach, an itinerant life was hardly conceivable at that time for women. Therefore, Clare’s sisters lived in enclosure and dedicated their lives to manual labor and prayer. For a time, Francis himself directed the Order. Then in 1216, Clare accepted the role of abbess at San Damiano. As abbess Clare defended her Order against attempts by prelates to impose on them a rule that closely resembled the Rule of St. Benedict rather than Francis’s stricter determination to rely on alms. Clare sought to imitate Francis’ virtues and way of life. She saw Francis as a spiritual father and played a significant role in encouraging and aiding him. She cared for him during his illnesses at the end of his life and was with him when he died in 1226. After Francis’s death, Clare continued to promote the growth of her Order. She wrote letters to abbesses in other parts of Europe. She thwarted attempts by each successive pope to impose any rule on her Order which would diminish their radical commitment to corporate poverty. She worked hard despite the poor health which plagued her until her death. On August 9, 1253, Pope Innocent IV issued the papal bull “Solet Annure” which confirmed that Clare’s rule would be the governing rule for the “Order of Poor Ladies”. Two days later, on August 11, Clare died at the age of 59. Her remains were temporarily interred at the chapel of San Giorgio until a church to hold her remains could be built. In the 1255 document of her canonization, numerous miracles attributed to St. Clare are retold. For example, upon finding an empty jar miraculously filled with oil when they were in need, Clare believed that God had filled it as “a gift of divine generosity.” The book, “Legend of Clare”, tells how Clare healed a young boy with an emotional disorder. Clare accepted all things and people as a gift from God. She did daily work with everyone else. She was attentive to each sister’s well-being. One day Clare suspected that a sister was suffering from depression. Clare gave her extra tenderness and care, and the nun was restored to health and peace of heart. On August 15, 1255, Pope Alexander IV canonized Clare. Construction of the Basilica of Saint Clare was completed in 1260; and Clare’s remains were transferred to the new Basilica and buried beneath the high altar. In further recognition of St. Clare, Pope Urban IV officially changed the name of the “Order of Poor Ladies” to the “Order of St. Clare.” in 1263. Clare is often depicted in art carrying a monstrance or pyx, the small vessel in which the communion host is carried. This commemorates the time when she warded off the soldiers of Frederick II at the gates of her monastery by displaying the Blessed Sacrament and kneeling in prayer. 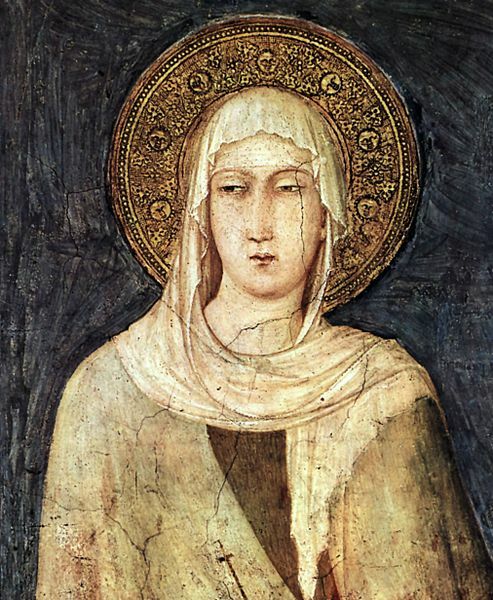 St. Clare was born Chiarra Offreduccio in Assisi, Italy on July 16, 1194 to a wealthy family. Her father, Favorino Scifi, was a count and her mother was the countess Ortalana, now a blessed. Her father died when she was very young. After hearing St. Francis preach in the streets one day, she confided to him her own desire to live her life for God. The two became good friends. On Palm Sunday in the year 1212, the local bishop presented Clare with a palm, which she took as a sign to follow her vocation. Clare and her cousin, Pacifica, ran away one night to enter the religious life. She soon accepted the veil of a nun from St. Francis at the Church of Our Lady of the Angels in Assisi. San Angelo in Panzo, until she was finally sent to San Damiano where she founded the first community of the Order of Poor Ladies (later the Poor Clares.) She led this order for forty years. Everywhere the Franciscans established themselves throughout Europe; there also went the Poor Clares, depending solely on the providence of God to subsist. This was a new idea at the time. In the beginning, most of the young girls who joined her in this life of radical poverty were from the noble families of Assisi and the surrounding area. At first they had no written rule to follow except for a very short 'formula vitae.' Over the years prelates tried to draw up a rule for the order largely based on the Rule of St. Benedict, however, Clare would reject these attempts in favor of the 'privilege of poverty,’ wishing to own nothing in the world and depending entirely on the providence of God and the generosity of the people for their livelihood. Francis placed her temporarily with the Benedictine nuns of San Palos near Bastia. Clare became a living example of the poverty, humility and the mortification expounded by St. Francis. She had a special devotion to the Blessed Sacrament and to increase her love for Christ crucified, she learned by heart the Office of the Passion composed by St. Francis. Under her guidance the community of San Damiano became a veritable nursery of saints. Clare's mother, Ortalana (blessed), and sisters Agnes (St. Agnes of Assisi) and Beatrix (blessed) later joined the order, as well as her faithful Aunt Bianca. Clare lived to see monasteries spread across Europe in her lifetime. A term commonly used to designate the members of the various foundations of religious, whether men or women, professing to observe the Rule of St. Francis of Assisi in some of its several forms. Here are in short the origin and relationship of these different foundations. These three orders — the Friars Minor, the Poor Ladies or Clares, and the Brothers and Sisters of Penance — are generally referred to as the First, Second, and Third Orders of St. Francis. The existence of the Friars Minor or first order properly dates from 1209, in which year St. Francisobtained from Innocent III. an unwritten approbation of the simple rule he had composed for the guidance of his first companions. This rule has not come down to us in its original form; it was subsequently rewritten by the saint and solemnly confirmed by Honorius III., 29 Nov., 1223 (Litt. "Solet Annuere"). This second rule, as it is usually called, of the Friars Minor is the one at present professed throughout the whole First Order of St. Francis (see Rule of St. Francis). The foundation of the Poor Ladies or second order may be said to have been laid in 1212. In that year St. Clare who had besought St. Francis to be allowed to embrace the new manner of life he had instituted, was established by him at St. Damian's near Assisi, together with several other pious maidens who had joined her. It is erroneous to suppose that St. Francis ever drew up a formal rule for these Poor ladies and no mention of such a document is found in any of the early authorities. The rule imposed upon the Poor Ladies at St. Damian's about 1219 by Cardinal Ugolino, afterwards Gregory IX, was recast by St. Clare towards the end of her life, with the assistance of Cardinal Rinaldo, afterwards Alexander IV, and in this revised form was approved by Innocent IV., 9 Aug., 1253 (Litt. "Solet Annuere"). (See Poor St. Clares). As regards the Second Order, of Poor ladies, now commonly called Poor Clares, this order includes all the different monasteries of cloistered nuns professing the Rule of Clare approved by Innocent IV. in 1253, whether they observe the same in all its original strictness or according to the dispensation granted by Urban IV. 18 Oct., 1263 (Litt. "Beata Clara") or the constitutions drawn up by St. Colette (d. 1447) and approved by Pius II., 18 March, 1458 (Litt. "Etsi"). The Sisters of Annunciation and the Conceptionists are in some sense offshoots of the second order, but they now follow different rules from that of the Poor Ladies. Secular. The third order secular was founded, as we have seen, by St. Francis about 1221 and embraces devout persons of both sexes living in the world and following a rule of life approved by Nicholas IV in 1289, and modified by Leo XIII., 30 May, 1883 (Constit. "Misericors"). It includes not only members who form part of Logical fraternities, but also isolated tertiaries, hermits, pilgrims etc. Regular. The early history of the third order regular is uncertain and is susceptible of controversy. Some attribute its foundation to St. Elizabeth of Hungary in 1228, others to Blessed Angelina of Marsciano in 1395. The latter is said to have established at Foligno the first Franciscan monastery of enclosed tertiary nuns in Italy. It is certain that early in the fifteenth century tertiary communities of men and women existed in different parts of Europe and that the Italian friars of the third order regular were recognized as a mendicant older by the Holy See. Since about 1458 the latter body has been governed by own minister general and its members take solemn vows. New Foundations. In addition to this third order regular, properly so called, and quite independently of it, a very large number of Franciscan tertiary congregations — both of men and women — have been founded, more especially since the beginning of the nineteenth century. These new foundations have taken as a basis of their institutes a special rule for members of the third order living in community approved by Leo X. 20 Jan., 1521 (Bull"Inter"). Although this rule is a greatly modified by their particular constitution which, for the rest, differ widely according to the end of each foundation. These various congregations of regular tertiaries are either autonomous or under episcopal jurisdiction.